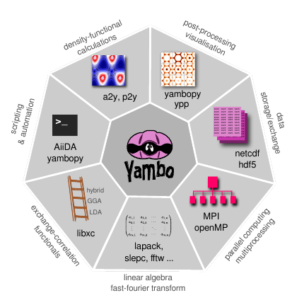 Yambo is an open source project aimed at studying excited state properties of condensed matter systems from first principles using many-body methods. As input, yambo requires ground state electronic structure data as computed by density functional theory codes such as Quantum-Espresso and Abinit.Yambo’s capabilities include the calculation of linear response quantities (both independent-particle and including electron-hole interactions), quasi-particle corrections based on the GW formalism, optical absorption, and other spectroscopic quantities. This entry was posted in software, yambo on 12/02/2019 by attacc.